Workers are the employees of the organization who physically carry out the work at the workplace. To perform efficiently and in a professional manner workers need knowledge, capability, and many qualities and traits. For doing the work at the workplace, workers work with various tools, equipments, instruments, implements and processes. The performance of the organization depends on how efficient the workers are at their workplace. Further, healthy, well trained, knowledgeable, disciplined, motivated, safe, alert, honest, and hardworking workers manage their workplaces in a manner which make them more productive. The traits, which the workers need for efficiently managing the activities at the workplace, include teamwork, integrity, commitment, and work ethic. Workplace is the place where a worker performs his activities. There need to be dynamic alignment of workplace activities with the work environment for efficiency, peak performance, and reduction in the costs. In a way, what is workplace for a worker is very much similar to what is an organization for a management. 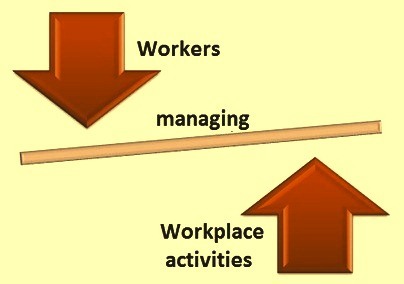 The performance of the worker depends on how he manages his workplace activities. He is required to manage the workplace activities (Fig 1) ably, strongly, and proficiently to be productive. Workers who manage the workplace activities well make a difference in the workplace and have a voice, a say in how the work is done. A worker to be professional is to conduct himself with responsibility, accountability, and excellence. It means proper planning of the workplace activities along with communicating effectively and appropriately and always finding a way to be productive. It also means managing of available resources at the workplace efficiently. The worker is required to be ethical, team oriented, and to possess strong interpersonal and problem solving skills. Main qualities and traits needed by a worker for the management of his workplace activities are described below. Planning – It is a very important and basic function of the management. Planning is nothing but looking ahead. It is a preparatory step and consists of chalking out an activity plan for doing the things in an orderly manner for the achievement of the desired targets and objectives. It is a mental predisposition to think before acting and to act in the light of facts rather than guesses. It is a systematic activity which determines why an action is needed, what is to be done, how it is to be done and when to be done. It makes possible things to occur which would not otherwise occur. It takes into consideration of available human and physical resources at the workplace so as to get effective co-ordination, contribution as well as perfect adjustment. The idiom ‘well planned is half done’ amply describes the importance of planning in the management of the workplace activities. Communication – Communication is a process of transferring information from one person to another. Effective communication in the workplace is very important since (i) the work processes are very complex these days which need close coordination among the fellow workers, (ii) the pace of work is very fast, and (iii) there are lesser workers and they are distributed. Workplace communication includes communication with work processes, communication with superiors, and communication with fellow workers. It is a channel for flow of information and includes activities of sending and receiving messages. It is a two way process in which there is an exchange of information towards a mutually accepted goal or direction. The two way communication includes both the vertical communication and the lateral communication. Disciplined working – Discipline is the force which prompts the worker to observe rules, regulations, systems, processes and procedures which are considered to be necessary for the effective functioning. It is basically an attitude of the mind, a product of culture and environment. In a workman’s life, discipline takes the prime position. At the work place he has to follow various work disciplines which includes safety discipline, technological discipline, time discipline, quality discipline, cost discipline and so on. He can violate any of these disciplines only at the cost of the performance. Violation of technological discipline in a process makes the process unpredictable, uneconomical, unsafe and unreliable besides resulting into productivity loss, lower product quality, increase in specific consumptions of materials, utilities and energy besides causing permanent damage to the equipment. Disciplined working reduces / eliminates human errors, prevents common mistakes and improves consistency in the work. It also improves efficiency, saves time and even facilitates creativity. Knowledge and education – The skills of a worker is fundamental to his success at the workplace. It helps in increasing his performance, productivity, professional competence and future growth. Further, one of the important features of working life of a worker today is that whatever education and training is acquired at the start, become redundant or obsolete during his working lifetime. The need to train as well as to obtain new knowledge, new skills and new attitudes has become an everyday aspect of working life of the worker. In some cases, this needs a complete change from one occupation to another, but in others it may merely be an updating process. Both education and training in broad terms have contribution towards the skill development of the worker. While basic education gives the worker a basis for the development of his potential, laying the foundation for employability, the initial training provides the core work skills, general knowledge, and industry based and professional competencies which facilitate the transition from education into the field of work at the work place. Lifelong learning maintains worker’s skills and competencies since work, technology and skill requirements change with time. Teamwork – Teamwork is a method which aligns the mindset of a worker in a cooperative and usually selfless manner, towards a specific purpose. It is the co-operative effort to achieve a common goal. At the workplace a worker is to be a team player. He is to work in a team with other workers working at the workplace rather than as individual. He is to subordinate his personal aspirations and is to work in a coordinated way at the workplace for the purpose of achieving a common goal. He is to collaborate with other workers at the workplace and use his talent and experience to contribute to the success of the common objectives. For the formation of a successful team at the workplace, a worker needs a wide range of skills besides the needed technical knowledge. Some of these skills are listening, discussing, questioning, persuading, respecting, helping, sharing, participating, and communication. Working with system and procedures – At the workplace, it is essential that a worker performs efficiently so that he can be productive. Working with systems and procedures provides the worker the necessary implements for this need. A system is a set of detailed methods, procedures and routines created to carry out a specific activity, perform a duty, or solve a problem. Procedures are step by step sequence of activities or course of actions with definite starts and endpoints. They constitute series of steps establishing a planned method of carrying out an activity. A number of procedures make a system. Procedures are followed to perform a task correctly. Repetitive procedures are called routines. A worker is required to be thoroughly trained in the work procedures. For training, both the methods of class room training and on the job training can be adopted. It is necessary that work procedures are followed in totality without any deviations and with dedicated discipline. Interpersonal behaviour – Interpersonal relationship at workplace is nothing but close relationship between the workers working at the same place. Workers must get along well for a positive and healthy work environment at the workplace. A worker spends around eight hours at his workplace and it is practically not possible for him to work all alone. He needs co-worker to talk to and discuss various issues at the workplace. Interpersonal relationships require good effort from the workers to nurture and maintain. A healthy interpersonal relationship gives a worker joy and satisfaction. It is a common fact that the productivity increases manifold when he work together in a group as compared to when he is working alone. Machine management – The automated processes of today need machines and equipments which require human intervention for controlling them. Intervention by a worker in the production processes has undergone a big change after automatic and computerized controls have been introduced for the production processes. A large number of activities previously done by workers have been taken over by the automation. But this has not eliminated the need for worker for the running of the equipment / process though his role has changed a lot with the automation of the process. Close and harmonious interaction by workers with their machines is a necessity for the productive output. An integrated and coordinated communication between machines and the men operating them is needed for the productive output. Management of workplace conflicts – Workplace conflicts are inevitable. They happen whenever there are workers in the organization with different expectations. They happen when personalities clash, when team members perceive interference from one another, when a worker is unable to progress due to the action of other worker. Workplace conflicts take place when there are opposing positions, competitive tensions, power struggles, ego, pride, jealousy, performance discrepancies, and compensation issues etc. Developing effective conflict resolution skill in the workers is an essential component for building of a sustainable and successful workplace. Unresolved conflicts often result in loss of productivity, the stifling of creativity, the creation of barriers to cooperation and collaboration. Time management – Time is a basic resource and hence it need to be spent judiciously. Management of time is the act or process of planning and exercising conscious control over the amount of time spent on specific activities, especially to increase effectiveness, efficiency or productivity as well as for carrying out the activities effortlessly in a natural way. Management of time may be aided by a range of skills, tools, and techniques when accomplishing specific tasks and complying of goals within the due time. Time management includes (i) creating an environment conducive to effectiveness, (ii) setting of the priorities, (iii) carrying out activity around the set priorities, and (iv) the related process of reduction of time spent on non-priorities. Time management needs an environment which is conducive for effective time management. The environment conducive for time management can be obtained (i) by getting organized and setting proper priority for tasks, (ii) by protecting one’s time by insulation, isolation and delegation, and (iii) by achieving time management through goal management and through goal focus. Uncertainty management – It exists when details of situations are ambiguous, complex, unpredictable, or probabilistic; when information is unavailable or inconsistent; and when the workers feel insecure in their own state of knowledge. It also might be experienced when a worker assesses the probability of an event taking place at the workplace. A curvilinear relationship exists between beliefs about probability and uncertainty, such that uncertainty is lowest when the probability of occurrence is believed to be 0 % or 100 % and highest when the probability of occurrence is believed to be 50 %. A worker experiences increasing uncertainty as likelihood of an event occurring or not occurring becomes equal. If multiple alternatives are possible, uncertainty is highest when all events seem equally probable. Underestimation of uncertainties can lead to strategies that neither defend against the threats nor take advantage of the opportunities that higher level of uncertainties may provide. At the other extreme, too much importance to uncertainties can lead the workers to abandon the analytical rigour of their traditional planning processes altogether and base their strategic decisions primarily on gut instinct. Workers who become conscious to uncertain environments do not trust their gut instincts and suffer from decision paralysis. They avoid making critical strategic decisions. Hence no attempts are made to face the challenge of uncertainties. Workplace stress management – Workplace stress occurs when there is a mismatch between the demands of the job and the resources and capabilities of the individual worker to meet those demands. It is the adverse reaction which the workers have to excessive pressures or other types of demand placed on them. There is a clear distinction between pressure, which can create a ‘buzz’ and be a motivating factor, and workplace stress, which can occur when this pressure becomes excessive. Workplace stress is a matter of great concern. Excessive stress can interfere with the worker’s productivity and impact the physical and emotional health and the ability of the worker to deal with it. It can mean the difference between success and failure. Resources that help to meet the pressures and demands faced at work include personal characteristics such as coping skills (e.g. problem solving, assertiveness, time management) and the work situation (such as a good working environment and support from the management and colleagues). These resources can be increased by investment in work infrastructure, training, good management and employment practices, and the way that work is organized. Management of workplace fatigue – Workplace fatigue is a physical and/or mental state caused by overexertion. It is an acute, ongoing state of tiredness that leads to mental or physical exhaustion and prevents people from functioning within normal boundaries. In a work context, fatigue reduces a worker’s ability to perform work safely and effectively. It reduces the worker’s capabilities to an extent that may impair his strength, speed, reaction time, coordination, decision making, or balance. It can occur because of prolonged mental or physical activity, sleep loss and/or disruption of the internal body clock. It is caused by prolonged periods of physical and/or mental exertion without enough time to rest and recover. The best way to control fatigue risks is to eliminate at the source those factors which are causing it. If this is not reasonably practicable, then it is necessary to minimize the risks. Safety and health at workplace – Safety and health at the workplace is essential for preventing injury and illness to the employees at the workplace. By making available safe and healthy working environment at the workplace, the lost work hours are reduced and hence the cost which is associated with it. It also eliminates the interruption to the operations with resultant increase in productivity and quality. A safe and healthy workplace raises workers’ morale. Successfully managing safety and health in the workplace relies on commitment, consultation and co-operation. A worker in the workplace needs to understand the need for safety and health, what is his role is in making the workplace safer, and how he can fulfill his responsibilities and duties. He is to take practical steps that protect him from harm. Housekeeping and cleanliness – Housekeeping and cleanliness refer to the processes which ensure facilities, equipment, work areas and access routes are kept in good condition. These conditions are required for supporting safe and reliable operation and maintenance during normal plant operation. Housekeeping and cleanliness are not only crucial to a safe workplace but they also improve productivity and morale, as well as make a good imprint on the people visiting the workplace. Additionally, during the emergency, housekeeping and cleanliness ensure that the plant operations are not inhibited. Housekeeping and cleanliness are important activities which are visible indicators of the general standards of quality at the workplace. The importance of good workplace housekeeping and cleanliness to the overall operation is to be firmly planted in the consciousness of each worker. For housekeeping at the workplace, a worker can practice 5S philosophy. 5S philosophy is a way of organizing and managing the workspace and work flow with the intent to improve efficiency by eliminating waste, improving flow and reducing process unreasonableness. It is for improvement of working environment. It is a structured approach to achieve clean and orderly work place by fixing place for everything. Five Ss is an abbreviation for the Japanese words (i) Seiri, (ii) Seiton, (iii) Seiso, (iv) Seiketsu, and (v) Shitsuke. Seiri is getting rid of unnecessary items. Seiton consists of arranging items (materials, tools, gauges) systematically for ease in their retrievability. Seiso means keeping of the work place scrupulously clean. Seiketsu is scheduling of regular cleaning and clearing out operations. And Shitsuke is making the entire above task to meet agreed standards at agreed intervals. Management of workplace activities is not simple. It needs an understanding of a large number of management principles for which today’s worker is to have at least basic knowledge. The present day worker is to management the workplace activities to be productive and efficient.